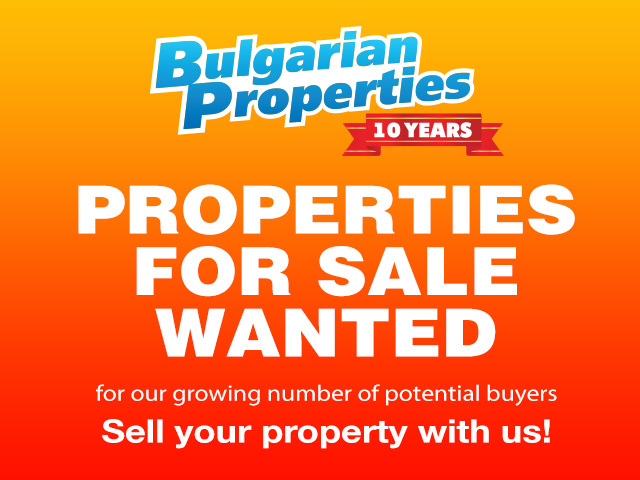 Why sell your property through BULGARIAN PROPERTIES? BULGARIAN PROPERTIES is the leading real estate agency in Bulgaria with over 15 years experience. During all these years we have managed to set up an effective organization for sale of finished properties, old properties, new properties and off-plan properties all over the country. • High popularity of our company and excellent identification of our trade mark through which we sell and rent the properties – BULGARIAN PROPERTIES. We have solid positions on the market both among Bulgarian buyers and foreign buyers from Russia, the UK, Ireland, Romania, Greece, France, Spain and many more. Our statistics show that almost all foreign clients looking to buy a property in Bulgaria visit our websites to check what the biggest company on the market can offer. Our two sites generate over 10,000 unique visits per day! • Well optimized advertising policy and high effectiveness of the marketing of our offers. We have an efficient network through which we advertise your property via all possible channels and through a great number of media – Internet, specialized newspapers and magazines, TV, radio, brochures and catalogues, property exhibitions. Moreover, we use the most up-to-date methods to present the offers – with quality digital photos, video clips, detailed descriptions, banners, floor plans, maps and many more. All these present your property in the best possible light and facilitate potential buyers. With us your property will reach the right buyers! This guarantees a short sale period and an optimal asking price. • A trust to our company by the buyers which we have gained through years of hard work, conformity to high standards of service and a complete cycle of the services for property owners: a wide choice of offers, professional advice, protection of interests, purchase-property management-return from renting the property, profitable resale of the property. Buyers know that when they buy real estate in Bulgaria with BULGARIAN PROPERTIES their interest is protected during the whole process and they are supported by a professional organization taking care of everything – before, during and after the sale. • Professional sales skills of our team members. The best real estate agents work with us! Dealing with properties and high-value assets demands excellent trading and negotiation skills and knowledge. BULGARIAN PROPERTIES has experienced, talented and well trained real estate agents. Successful property deals are always concluded thanks to the successful negotiations and the skills for presenting the property in its best light. We also put great effort into providing constant training to our staff dealing in property sales. With us sellers will find professional agents who will not only consult them but will also sell their property in Bulgaria! Over 15,000 sold properties around Bulgaria! Over 70,000 registered potential clients from around the world!